These Graduation 2019 Basketball Athlete Silver Round and Silver American Eagle 2pc Gift Sets are able to be personalized with custom engraving as well as your choice of fitted box sleeve; see options below. Perfect gift set for a basketball athlete graduating in 2019, a total of 2 Troy Ounces of .999 Fine Silver. This set includes the SilverTowne Minted 1oz Basketball Themed Round with an engravable back and the current year-dated 2019 American Silver Eagle BU issued from the US Government with a $1 Face Value. The 2019 Year-Dated Silver Eagle coin commemorates the graduation year for the graduate and the Basketball silver medallion personalizes the gift for the basketball athlete/player/fanatic! Personalize your Basketball Silver Round with custom engraving. The reverse has an open area just for this; many customers will engrave the Graduate's name along with the graduation date, school name and/or a special message of encouragement to make each piece, a truly one of a kind gift that will be treasured for years to come. Once your order is submitted, each piece is handled with care by our engraving department to make your message perfect! The mat itself is silver foil stamped on several different mat colors. Unfortunately we cannot guarantee the color mat you will receive, but you can add notes to your order requesting colors you would like. Colors normally available are black, green, red, maroon and blue. Your Basketball Silver Round and 2019 SAE Gift Set will arrive in a protective plastic capsules inside of our SilverTowne gift box made in the USA with black embossed linen paper from recycled materials featuring a heat-stamped black SilverTowne Logo on top. A velvet mat insert holds your medallion and SAE snug inside the box inside their individual protective plastic capsules. 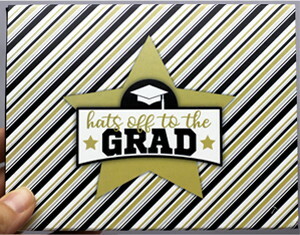 Topping off the gift box is a custom fitted sleeve featuring a "Hats Off to the Grad" gold, white and black striped design; with several sleeve designs available, see above for alternate packaging options to choose from! Try matching the bow colors to school/team colors! 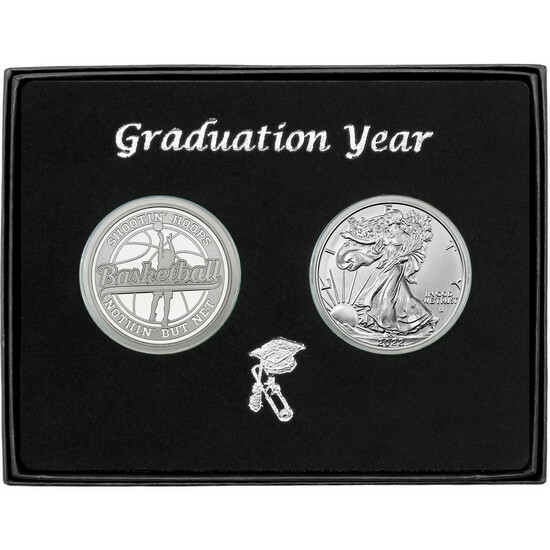 The Graduation 2019 Basketball Athlete Silver Round and Silver American Eagle 2pc Gift Set is a SilverTowne Mint Minted Bullion Product. Located in Winchester, Indiana, The SilverTowne Mint has been manufacturing quality Silver Bullion produced with the Highest Quality Standards since 1973. When purchasing the Graduation 2019 Basketball Athlete Silver Round and Silver American Eagle 2pc Gift Set on SilverTowne.com you are buying direct from the source!